Rare earth metals had a bumpy ride during 2009. The investment community suddenly discovered the potential returns from rare earths, which have spent years in relative obscurity, after the little-known metals were cast into the spotlight by reports that China might restrict exports and cause prices to move much higher. Several rare earth metal explorers watched their share prices double in a matter of weeks and some put in gains of over 400%! The NY Times article "China Tightens Grip on Rare Minerals" helped to shine the light on the extreme geographic concentration of rare earth metal production. Over 95% of rare earth metals are currently mined in China and the Communist government is trying to ensure that all raw REE materials are processed within its borders. During the past seven years it has reduced by 40 per cent the amount of rare earths available for export and some are estimating they will begin halting exports as early as 2012. Even if China continued exporting at current rates, demand is rapidly outpacing supply and many are predicting a 40,000 tonne annual shortfall by 2015. Watch the Reuters video on rare earth metals. After a brief period of rare earth mania, the share prices of many companies have since returned to more fair valuations. But a rebounding worldwide economy and growing concern over China's control of such a strategic resource are once again pushing rare earth metals into the spotlight. On January 2nd, an article in the UK Independent titled "Concern as China Clamps Down on Rare Earth Exports," is once again stirring up investment demand. "...ZHAO ZENGQI: Although China has the largest reserves, we only have 50 percent of global deposits. We are supplying too much rare earth, and it's not sustainable, so we must restrict export." Rare earth metals have significant importance not only to new technologies such as the iPhone and flat screen TVs, but also to clean energy applications like electric car batteries, wind turbines and low energy bulbs. But even more critical as far as Western governments are concerned is their use in high-tech strategic military and defense weaponry. Guided missiles and other precision weapons, for example, rely on rare earth metals and magnets to help direct their course. With insatiable consumer demand for high tech gadgets, clean energy mandates from countries around the globe and out-of-control military spending, it seems likely that demand will only increase as supplies are threatened. This is the recipe for much higher prices in rare earth metals and the companies that mine them. In the first day of trading during 2010, shares of rare earth explorers are already beginning to shoot dramatically higher. While commercial scale production is still a few years away, the following companies are top prospects for becoming the next major producers of rare earth metals and helping Western nations secure a new strategic source outside of China. Avalon's project at Thor Lake in Canada has global importance with its ability to offer NAFTA access to rare earth metals for decades to come. The Company's primary focus is on rare metals and minerals, including calcium feldspar, lithium, tantalum, cesium, indium, gallium, yttrium and the rare earth elements (REEs). The company is in the process of exploring or developing three of its six mineral resource properties and has active projects (Thor Lake Rare Metals Project (Thor Lake), Separation Rapids and East Kemptville). Avalon has returned very high-grade drill results and their Thor Lake deposit has high concentrations of heavy rare earth elements, nearly double the typical concentration. Click here for an audio interview with Don Bubar, Director, President and CEO, of Avalon. You get immediate confidence that Avalon's top executive knows the industry, is modest in his assumptions, has a plan to production and is a competent hand at the wheel of this company. Canada's CBC News also did an expose on Avalon Rare Metals recently, which I encourage you to view below or by clicking here. Avalon shares retreated from a high near $4 in September to a low of just $2 in November. 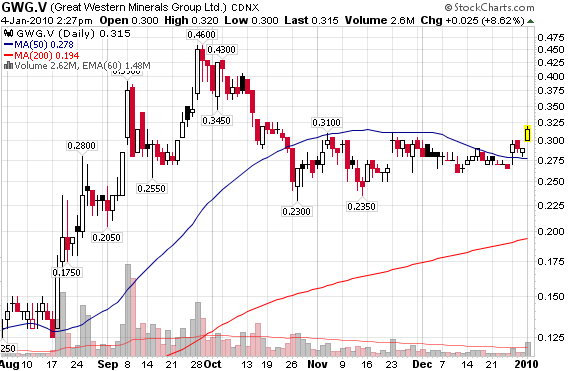 After consolidating around $2.25, Avalon has broken out and to $3.00 and looks poised to move higher into 2010. Lynas owns the richest deposit of Rare Earths in the world at Mt Weld, 35km south of Laverton in Western Australia. A feasibility study has been completed on the Rare Earths deposit and all Australian approvals required for project development have been received. Lynas completed a AUD$450 equity offering in October of 2009 and is attracting the interest of institutional investors such as Morgan Stanley. For U.S investors, the ADR share of Lynas are currently trading at $0.54, after reaching $0.88 in September of last year. While their resource is not nearly as large at Avalon or Lynas, some analysts believe Great Western will be the first company outside of China to produce heavy rare earths economically. GWMG is engaged in the acquisition, exploration, and development of rare earth mineral properties in North America and Africa. Current properties include two rare earth projects in Saskatchewan, Canada, one in New Brunswick, Canada, one in Utah, USA, and one in South Africa (see Projects). The most advanced projects is the 100%-owned Hoidas Lake Rare Earth Project, located in northern Saskatchewan, and the Steenkampskraal Project in South Africa. Great Western recently increased the overall resource estimate at Hoidas Lake by 123% to 2,560,835. They also cleaned up their balance sheet in 2009 and after consolidating between 25 and 30 cents for the past few months, their stock look poised to break out. Only time will tell if rare earths become the next big investment opportunity or just another over-hyped bubble. I feel that the fundamental supply/demand situation for rare earth metals and their importance to high tech industries, the clean energy revolution and military applications will be a potent combination in pushing prices much higher over the next few years. Disclosure: I am long Avalon Rare Metals and regularly swing trade this and other rare earth stocks. If you would like to view the Gold Stock Bull portfolio and receive email alerts whenever I am buying or selling a stock, sign up for a premium membership at just $35/month.